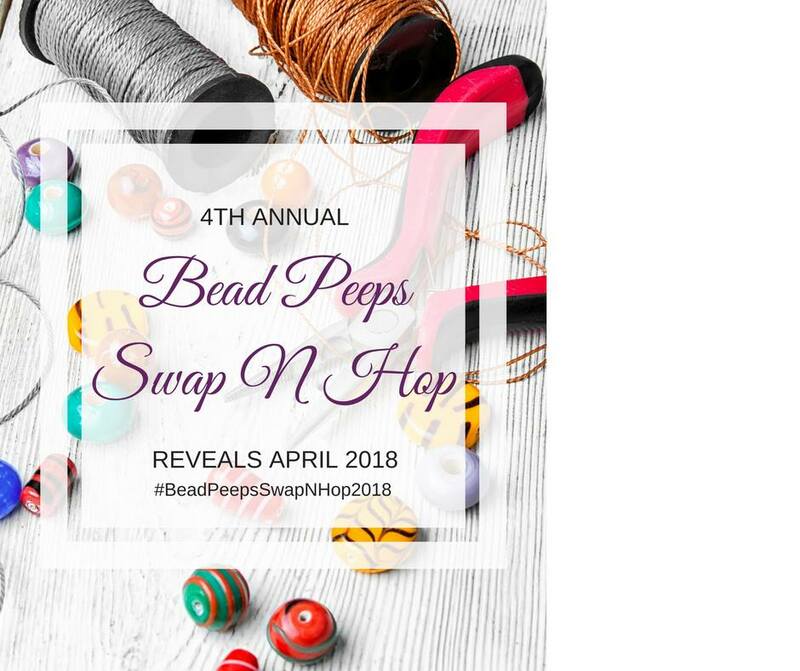 Art in Beads and Threads and more.............: Bead Soup Blog Party, Bead Hoarders Edition 2017- Reveal!! 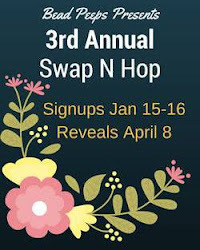 Bead Soup Blog Party, Bead Hoarders Edition 2017- Reveal!! It`s finally time for the big reveal, the Bead Soup Blog Party, Bead Hoarders Edition 2017 hosted by Lori Anderson. And I am partnered with Alenka Obid from Slovenia. This is a wire crocheted necklace I made using a beautiful lampwork and metal bead, made by Carolyn Chenault, that Alenka sent me. The lovely colors remind me of the precious stones, so I used a mix of similar colored jade, topaz and tourmaline beads that I had left from my prevoius projects . The clasp is a handmade copper one that was sent as a part of a swap a few years ago by Jami Shipp . And I found much to my delight, that it matched perfectly with the little copper disc in the pendant. I kept the pattern simple for this one as I did not want to draw the attention away from the focal.. This is the second necklace where I have used the large heart shaped polymer focal made by Alenka. Since the color is so fresh and green, I have paired it with the vintage finish chain and lovely oblong seed beads sent by Alenka. 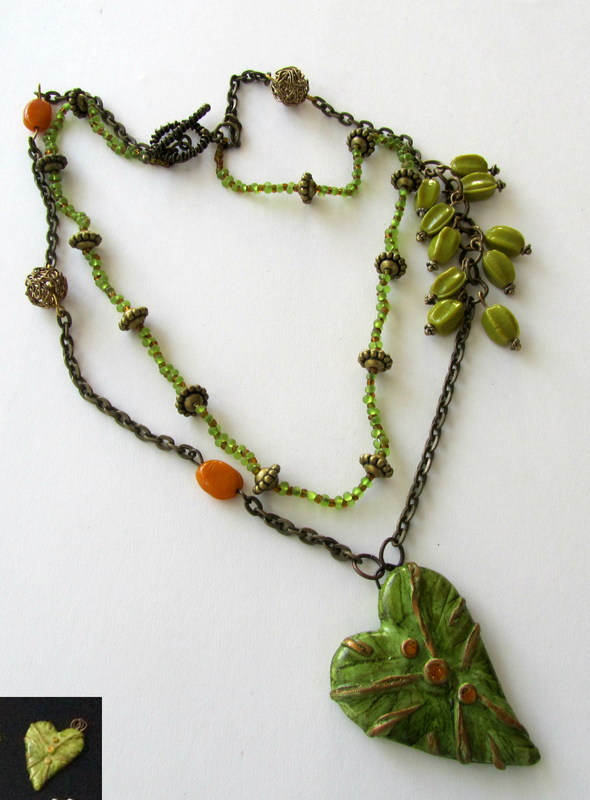 Indian glass beads from my collection along with hand made wire beads complete this lovely foliage necklace. The beautiful pair of ceramic beads have a wonderful earthy look and so I paired them with a large flat ceramic bead from my stash. To give this necklace a rustic look, I used the lovely copper chain and some wire wrapping. It is a long necklace and hangs perfectly when worn. And here`s the last Necklace I made. 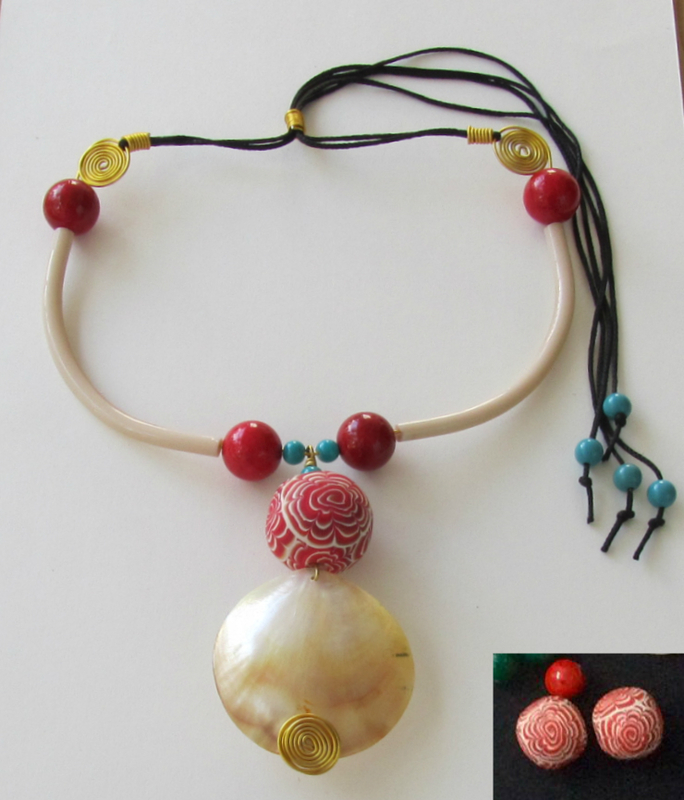 I have teamed up the red beads and the large focal from Alenka`s beads ,with a shell focal and a pair of Indian glass pipes. A wire closure adds a touch of ethnic twist to this draw string necklace. I`m signing off for now and I`m off to drool over the lovely creations put up by everyone. Four beautiful pieces, each with its own special feel! 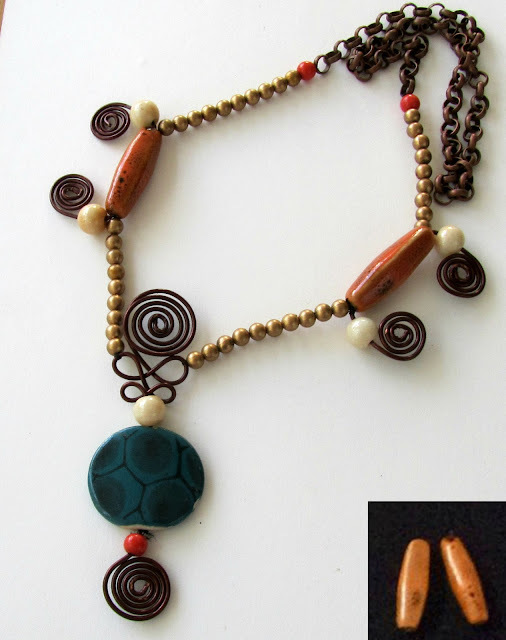 I especially love the necklace with the ceramic beads. It is so fun with all those wire swirls. The fact it's long makes it even better, I love long necklaces. It was great to see your soup and what you did with it! Thank you Liz for the kind words. It`s fun making things you love and when friends inspire you, it`s awesome. Loving every bit of this party!! You received a wonderful soup and your creations are beautiful! It is so much fun to see what people create! Hello! Wow, you've made some beautiful colourful pieces with the beads I've sent you. My favorite of all is the necklace with the polymer clay heart - the assymmetrical shape and those green pod shaped (Indian?) beads are perfect together. Thank you for your partnership in this party and happy creating with the rest of the soup! I truly appreciate your kind words for my efforts for the collection. I was thrilled when I received your beautiful package, and it inspired me to work hard and create these pieces.And I learnt so much in the process. Such unique work, and such very different pieces! I really love the wire crocheted necklace. That`s my favorite too. I just fell in love with the beautiful focal and tried wire crochet for the first time. And was thrilled with the attempt. Your pieces are beautiful. I love the colors in the crochet piece, and I love the crochet look in jewelry. Thank you. The green focal reminded me of fresh leaves in spring so I had to build my piece around that theme. I`m really grateful to Alenka for the carefully thought of soup she sent me. Oh that`s so very true Divya. It was a real challenge to make pieces that were not bead woven , something I have always wanting to do but did`nt know where to start. My partner Alenka sent me such lovely beauties, that I was inspired to move away from my usual techniques and learn something new. Of course the result you are seeing now is after a lot of trial and error LOl! Beautiful jewelry that is also unique. Each piece is so unique. I love the necklace with the crocheted wire - the design complements the focal bead. That`s my favorite too. Thanks for stopping by and viewing my work. You make very special items - very cool! Great wirework, elegant, feminine pieces! Thank you, I had so much fun putting this collection together! You put together things in ways I would never think of. Thank you for participating so I got to see them. I love color and thrive in it.And the Soup my partner sent was so lovely, that I had to make something with each element! Oh boy do your peices ever make me smile!! So fun and unique!! These are gorgeous and unique designs - I love how you've incorporated so many different beading techniques into your work. And that green leaf focal - just spectacular! I get a lot of my inspiration from ethnic and tribal jewelry from around the world.So it was just a matter of trying different techniques. And that green focal is my favorite too. I can't decide which one I love the best, they are all so unique and beautiful. Wonderful everyone. Hi Palek, all of your pieces are very creative. Great job using your swap beads. The green polymer heart necklace is my favorite. My fave too. Love it!! Lovely pieces, my favorite is the green one. Thank You ~KM. Feel great hearing from you. And I have finally found myself creating pieces other than my usual favorite- bead weaving ......Lol! What a gift (and artistic eye) you have. All of your pieces are so creative, fun, colorful, etc. 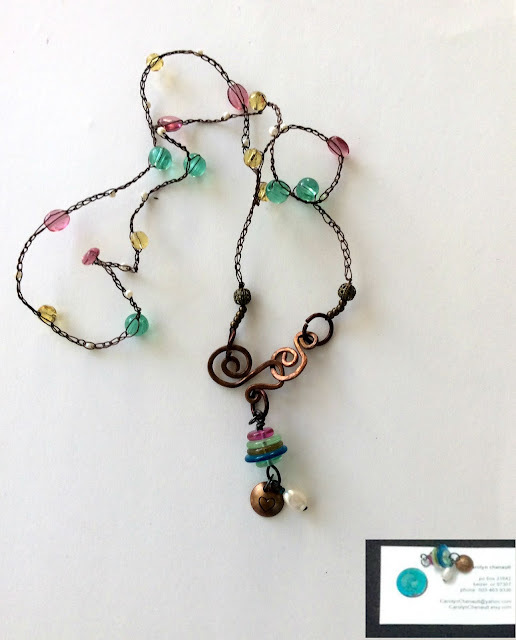 I also love the way you described your process and how you showed a tiny pic of the beads you used in each design. Great job, great soup. I agree with KM - I'd wear any of them - they're all beautiful!!! Thank you dear, I had so much fun putting this together! Shazaam! These are all fantastic! The third necklace has a tribal quality to it and I love its bold clean lines.The crocheted wire in the top piece works so well. The green heart, the shell, all 4 are just stunning! Wow you have been busy! Four very diverse and beautiful pieces. I love them all - but the green one is especially stunning - great job! Gosh, I love that first necklace! So colorful, but light and airy at the same time. Gorgeous. What attention grabbing pieces you designed and made! Each is unique and quite eye-catching. I bet they'll be fun to wear. Well done, each one. Thank you Kelly, I had so much fun putting this together! What a great group of necklaces - love them all! I adore the uniqueness of your style. I can tell you put much thought into each of these. My favorite is the first one though. There's just something so delicate and feminine about the crocheted chain that really appeals to me. Wonderful work. I love everything you made! I had Alenka as a partner one year and got an orange heart (you can see it as the first photo in the long list of names on my blog!). I'm so happy you participated! Oh yes, that was the first thing I saw when I visited your blog. Been following your Bead Soup from the time you started but gathered courage to participate only now. And believe me I had so much fun, and am learning so much. I can`t thank you enough!! I love the use of crochet in jewelry! Beautiful job! Wow. I'm so jealous! 4 pieces!! You are an over achiever for sure! Great job on all 4 designs. All are gorgeous!! You had a beautiful soup to work with! You have made so many nice things but I am very drawn to the green necklace with the polymer leaf its so spring like! Thank you . I love the necklace too. It reminds me of a rain forest, so lush and green.. I love the foliage necklace. It is clever and fresh. The color is perfect for this year's spring fashions with the emphasis by Pantone on greenery of this year. Well done! These are just beautiful!! I love the crochet wire piece...I tried my hand at that a while back...think I need to do it again. They are both so beautiful, it is hard to decided! Great job! Wow! You created so many wonderful pieces. I have a pair of Alenka's earrings similar to the red bead from your last piece. You're creations are beautiful in such an unexpected way. Wow. I love your work. Each design is so unique! The Beauty of Indian Embroidery - Kutchwork! The Beauty of Indian Embroidery - Shisha Embroidery or Mirrorwork ! Unique Jewellery Finds ----- Ostrich eggshell beads !